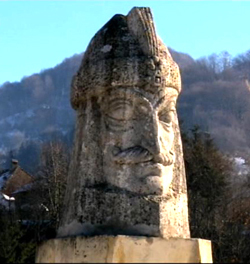 Inevitably probably due to numbers of men, Vlad was driven back to his sanctuary at Poenari - Castle Dracula the position of which would make it impossible for the Turks to make a full frontal assault. However, he could not stay there and needed to escape. A story is still told today of the ingenious manner in which Vlad made his escape from the Turks. He is said to have reversed the horseshoes on his horses hooves and ridden out of the castle Poenari into Transylvania and exile whilst fooling the Turks into believing that he was actually still in the castle. 10 years later Vlad would return to his palace in Bucharest when the time was right to once again make plans to repel a new Turkish invasion. However, before he could get far, his reign came to an end when he either died in battle or was murdered - no one really knows exactly what happened to him and his last resting place remains a mystery to this day. Despite his brutality, Vlad Dracula is today remembered as a Romanian national hero. He was the last great builder of an independent Wallachia and after his death, the Ottomans soon brought the country firmly under their control passing laws that would forbid the building of fortifications. However Dracula's castles remain today as a testament to a free past and a reminder of the indelible mark that Vlad Dracula has left upon his country!